4197-PN-DST is rated 4.0 out of 5 by 62. 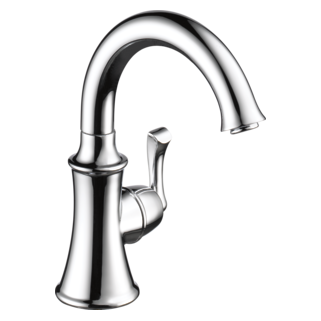 Rated 5 out of 5 by none from I like the style, and how smooth every thing works I bought the faucet on the advice of my plumber, which was good advice! Rated 5 out of 5 by jwegrzyn from Love the design! We finally got the faucet installed after ordering both it and a sink. We love the looks of the faucet. Hoping the quality lives up to the brand name, have heard some disheartening things about it. 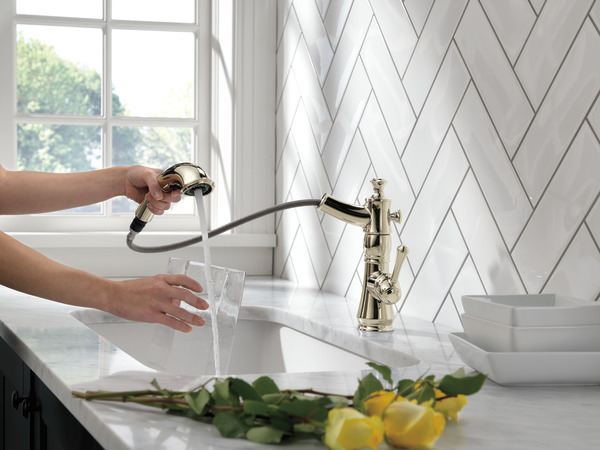 It's definitely a right-handed faucet! There was no aerator wrench in the box along with the faucet, so I contacted Delta via their website and had a brand new aerator and wrench in about a week! Impressed with the turnaround! The pull out spray makes things easier in the kitchen! 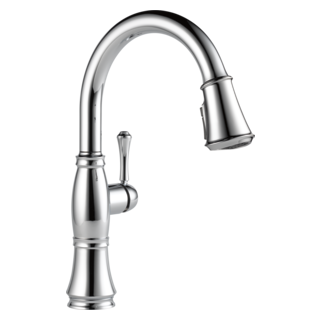 Rated 3 out of 5 by Doss1248 from write down the number of this faucet This is a great faucet but the valve failed after 3 years and had to be replaced. Luckily we wrote down the information and we could order a new valve instead of a new faucet! Rated 2 out of 5 by TracyC from Beautiful faucet with a lot of issues I bought this faucet because I love the look of it, and I love the champagne bronze color. However, it has been one problem after the other. Initially, the hose frayed. Delta was good with replacing the hose, but you have to put it in yourself, and although it doesn't require a plumber, it's not that easy. After that, the hose started to leak from where you pull the handle out. They sent me a new hose which has a different attachment. That hose has just started fraying, so they are sending me another hose, and another part that they think might be the issue as to why the hose is fraying. It is close to where the spray pulls out, so it's not rubbing on anything underneath. I have never had this issue with any other faucet before. It's a very expensive faucet, and it should have been designed much better! Rated 4 out of 5 by ChadS from Perfect for our kitchen We bought this faucet about 2 years ago. It's been great. Functional, easy to clean and looks great. Recently it's developed a leak where all the lines go into the base. Just curious if this is common or if there's an easy solution. 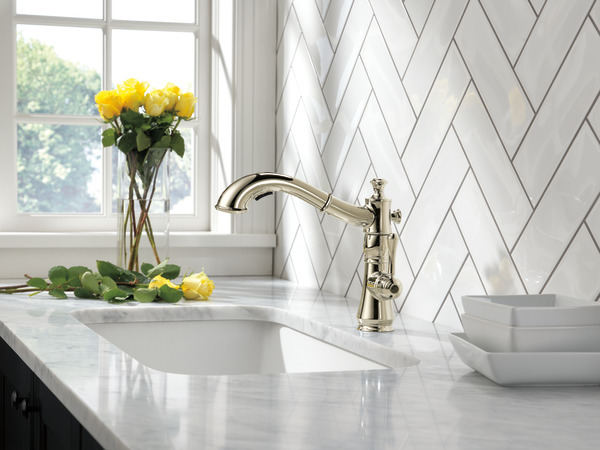 Rated 4 out of 5 by DMasi from Quality We picked this faucet when we refaced the kitchen in Jan 2019. We like the ease of use and the bronze color. Rated 2 out of 5 by LINDA from Obviously a design flaw! I bought this faucet and am having the same issue with the nozzle sliding back into the mount piece. I really like the look, but I am afraid that I am going to break my rather pricey faucet. My brother and sister-in-law have the same faucet and they advised they are having the same issue with theirs. Obviously a design flaw. Please let me know what you can do to resolve the situation. Rated 1 out of 5 by FlowerPower1234 from Hardly a Lifetime of Reliable Performance I bought this Delta Cassidy pull out sprayer faucet in Feb. 2017 and it's already failing. It's clogged, I have little water pressure, and I know it isn't the pipes since when I changed out the old faucet for this one, the pressure was about three times better than it had been. The difference was astounding. So it was the faucet that was the problem last time, and it's the faucet that's the problem again this time, and it only took a year and nine months to clog (it has been this way for about a month now). Delta advertises this as "lifetime of Reliable Performance as well as self cleaning and it's neither. We just built our new home and had this faucet installed. I love the classy look and cross handles we chose; however the lever that controls the hot and cold seems backwards to me. When it is lying down toward me, I can see the letter &quot;C&quot;. I would assume this means &quot;Cold&quot; but when I turn it on in that position the water is hot. Vice versa the other way. My husband checked the water lines and they are connected blue to cold and red to hot so that is not the issue. Is this just how the lever is designed? I'm very interested in your model # 4197 PN-DST in Polished nickel. 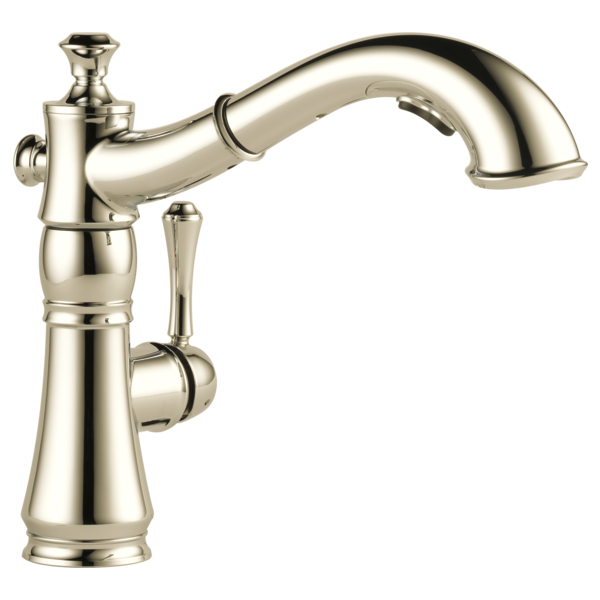 According to the little youtube video on this page, this model comes in 4 colors and the polished nickel is NOT one of them. So is the video correct, or can I order it in Polished Nickel? Is there a larger size escutcheon available for this model? I am mounting this faucet on a vintage cast sink with previously a 3 hole mount faucet. The area has some discoloration I am trying to cover. I purchased a RP714545 escutcheon but it is a little short for the coverage area I need. Is there a larger one that is compatible? I am trying to match pendant lights with the faucet. All lights are either brushed chrome or brushed nickle. The faucet is called stainless. What are the major distinctions between 4197 RB DST and 4353 RB DST? Appearance wise they are identical but with a $175.00 difference. When Setting up the soap dispenser can longer tubing be used and put directly into a bottle of soap on the cabinet floor? Instead of using the small plastic bottle that came with the soap dispenser, can you add a longer piece of tubing and extend it into a larger soap container that you can set on your cabinet floor? It would be much easier to get to when it needs replace.